The northern grains region has few studies reporting nitrogen (N) and phosphorus (P) fertiliser effects on grain P concentration and P removal. From a long-term experiment on the Darling Downs, Queensland, N and P fertiliser independently influenced both grain P concentration and P removal. Generally increasing N fertiliser rate decreased grain P concentration if grain yield increased with N supply, whilst grain P concentration increased with P fertiliser. 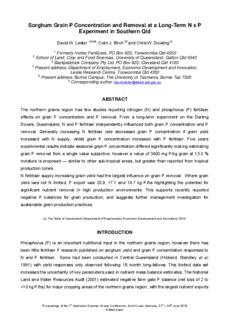 Five years experimental results indicate seasonal grain P concentration differed significantly making estimating grain P removal from a single value subjective; however a value of 3400 mg P/kg grain at 13.5 % moisture is proposed — similar to other sub-tropical areas, but greater than reported from tropical production zones. N fertiliser supply increasing grain yield had the largest influence on grain P removal. Where grain yield was not N limited, P export was 20.9, 17.1 and 19.7 kg P/ha highlighting the potential for significant nutrient removal in high production environments. This supports recently reported negative P balances for grain production, and suggests further management investigation for sustainable grain production practices.